Enjoy your spa or hot tub with a minimum of effort when you use the Cover Caddy hot tub cover lifter! No more wrestling with heavy spa covers or straining your back from awkward lifting. The Cover Caddy is perfect for the one person removal of your spa cover. The Cover Caddy is a hydraulic assisted cover lift defines versatility and effortless spa cover removal. It’s unique design allows for installation on an array of spa shapes and sizes including octagonal, and spas with larger radius or cut corners. The Caddy’s new under-mount base plate provides for a complete installation within minutes. The addition of a powerful a hydraulic assist makes lifting and lowering your spa cover easier than you ever imagined. 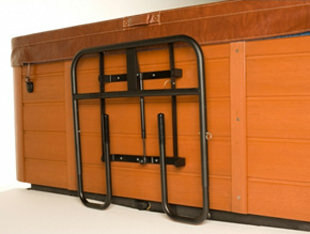 The Cover Caddy spa cover lifter attaches to the side of your above ground portable hot tub. Complete installation of the cover caddy takes only minutes. Once installed, you can operate with ease. The hydraulic shock does all the lifting and lowering for you! The lifter is also constructed of high grade powder coated aluminum hardware. This hot tub cover lifter is built to stand up in harsh environments and the Cover Caddy comes with an industry leading warranty. The under mount cabinet design works with all spas allowing you to store your cover conveniently to the side of your spa. Also, with the Cover Caddy lifter from The Cover Guy there are easy to follow instructions complete with diagrams making it easy to install.